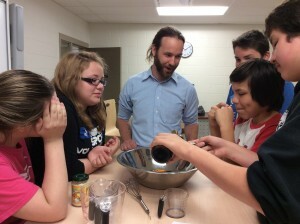 Toronto, October 13, 2015 – Eel Ground First Nation’s Healthy Bodies Healthy Minds and Healthy Spirits Project, supported by Canadian Feed The Children (CFTC) has been gaining recognition as a leading school health and nutrition program in New Brunswick. The Healthy Bodies, Healthy Minds, Healthy Spirits Project unites a multi-initiative health and wellness program around a common and culturally-meaningful theme. In January 2015, Eel Ground’s Natoaganeg First Nation School was featured as a school serving exceptional food in the “Where to Eat” guide from the Make Menus Matter project. The Make Menus Matter project is undertaken jointly by the New Brunswick Medical Society and New Brunswick Dieticians in Action. Natoaganeg First Nation School was identified as a leading school after registered dieticians analyzed over a hundred school menus to determine their alignment with provincial nutritional guidelines. More recently, Join the Wellness Movement; a campaign run by the province of New Brunswick, recognized Natoaganeg First Nation School as a Provincial Success Story and profiled their unique programming. 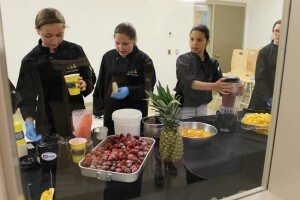 From the success of the school garden, to the Fresh for Less program, to family kitchens and empowering youth champions, Eel Ground First Nation’s Healthy Bodies Healthy Minds and Healthy Spirits has become a model for the province and the country. On June 17th, 2015 the new Natoaganeg First Nation School had its grand opening, including an industrial cafeteria. The new facility has provided further opportunities to develop and support the Healthy Bodies Healthy Minds and Healthy Spirits Program. It has allowed the cooks to make more food from scratch, and has given the school the chance to introduce a new, very popular salad bar and milk machine. With these long-awaited resources at-hand, Natoaganeg First Nation School is sure to continue to be a leader in school health and nutrition in partnership with CFTC in both New Brunswick and across the country.